"The whole city's going to hell, you can't take a pee anywhere anymore." 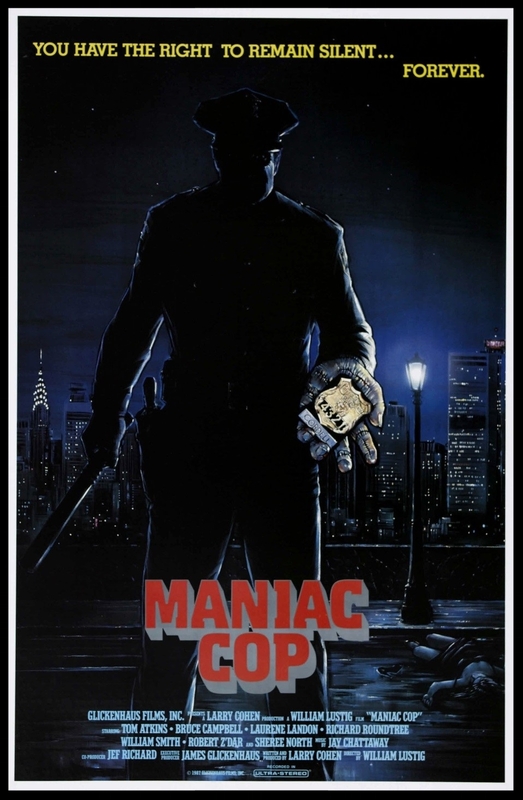 Maniac Cop (1988) is action-horror at its best. Terrifying, tense, thrilling, gritty, dark, and foreboding, the film is genre-movie crack for cult film fans. Another time-capsule picture that reminds viewers that New York City was once a festering cesspool of crime and terror, Maniac Cop remains as effective today as when it was first released. Written by b-movie auteur Larry Cohen and directed by William Lustig, the film is suffused with every ounce of their Bronx-raised toughness, making for a lean, mean cult classic. The premise of Maniac Cop preys on our worst fears, namely that the people who are supposed to protect us may in fact be just as dangerous. In other words, it's still a timely film. The opening scene sets the stage: a woman is stalked and chased by two potential muggers, only to run from danger into the supposed safety of a police officer's arms, except...he isn't what he seems. A series of brutal killings by this seemingly supernatural figure in an NYPD uniform ensues, setting the city on high alert, with bodies piling up around town, and as one police bureaucrat exclaims, "costing the taxpayers millions of dollars!" Jay Chattaway's eerie score and the haunting nighttime cinematography from James Lemmo and Vincent J. Rabe portend danger around every corner. Every scene - on the city's streets or inside the precinct house or in cramped apartments - is rife with peril, brilliantly keeping the audience on the same shaky ground as the film's characters and potential victims. The film boasts an all-star cast of cult cinema legends, including Tom Atkins, Laurene Landon, Bruce Campbell, Robert Z'Dar, Richard Roundtree, Sheree North, and William Smith. Roundtree - the sternly exasperated police commish - and Atkins - the hard-drinking, beleaguered cop who may be too compassionate for the job - are tremendous, especially when they face off across the desk in an early, intense scene. Bruce Campbell's studly, cheating husband and all-around dreamboat, Officer Jack Forrest, quickly becomes the number one suspect. Campbell has a lot of fun with the part's ambiguity, jutting his majestic chin as magnificently as ever. A bald-headed, gravel-throated Smith brings his usual and irrepressible intensity to the part of no-nonsense, badass Captain Ripley - a man who leaves his sunglasses on when informing an officer of his wife's murder, then asks if the fellow wants to see the "pretty pictures." Yikes. Laurene Landon is officer Theresa Mallory, with legs that won't quit and an attitude to match. When not undercover as a gum-smacking, gloriously crimped-haired prostitute, she's the woman Forrest cheats on his wife with. Mallory is a tough cookie, and after a near-death experience with the maniac cop, she and McCrae team up to hunt down the killer and prove Forrest's innocence. The film's various twists and turns keep us disoriented throughout, with unexpected character deaths only further throwing us off balance, until everything careens towards a chaotic and memorable finale. A cracking-good cult classic, Maniac Cop is easily one of the best genre films of its era, and well worth your time, especially if you like smart, taut, and nail-biting horror-thrillers.